I mentioned a few weeks ago that I’m that sucker of a friend who always ends up doing the decor for parties, wedding, showers and the like. My girlfriend Z, started pinning all sorts of things for her daughter’s 5th birthday, which I decided to tackle myself after a few sweet texts. 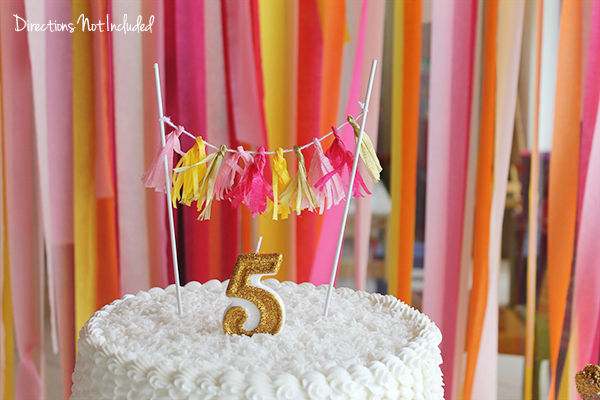 I shared the colorful fabric wreath, which served as the base for this party decor. This was last-minute crafting at its best so there are no step-by-step tutorials here. 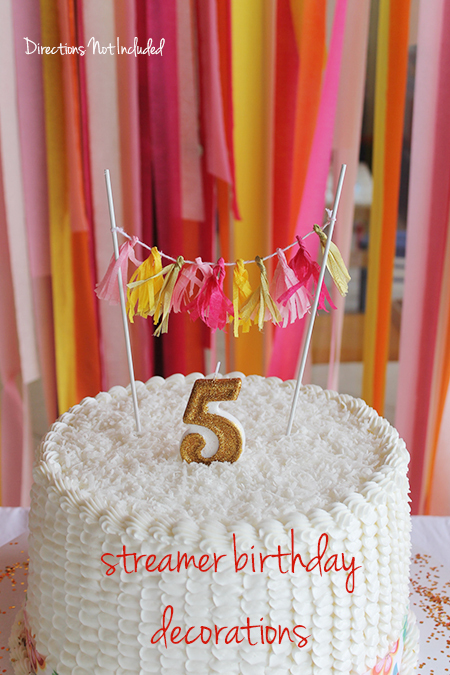 I created a streamer backdrop for the wall where she had the cake displayed. I used a piece of quarter round, tape and a bunch of crepe paper steamers. Guess what? There is no way to transport this already made so you have to do it on site. And South Florida humidity I learned, turns crepe paper into a wet, wrinkled mess. I started this project outdoors the night before the party, and quickly moved indoors to finish. This isn’t a rocket science project. Just get a quarter round or dowel long enough for your wall. Attach it to the wall using command hooks or something else. Then start obsessively attaching crepe paper streamers to it. I bought a ton of crepe paper and though these pictures only show a portion of the wall, this was an over 10 foot space that I covered with streamers. It looked amazing in person as it did in photos. This “chandelier” was another project for the party. Not something I would normally make, but it is what mom wanted. This is going to be a permanent fixture in the little girl’s room and she LOVED it. She kept telling me “This is for me, Anna? It is sooooo pretty”. I used two embroidery hoops, fabric, tulle, ribbon, and beads to get this to look like her inspiration. The cake topper is without a doubt the most last minute project I’ve worked on to date. My mom does most of the cakes for my friends and family. She’s quite talented, but since my dad was back in the hospital this week, Z and I were on our own. She had the cake made at a local bakery, found a glitter 5 candle, and I made the streamer garland at 12:30pm the day of the party. I used two skewers, a piece of baker’s twine and the streamers to make the garland. 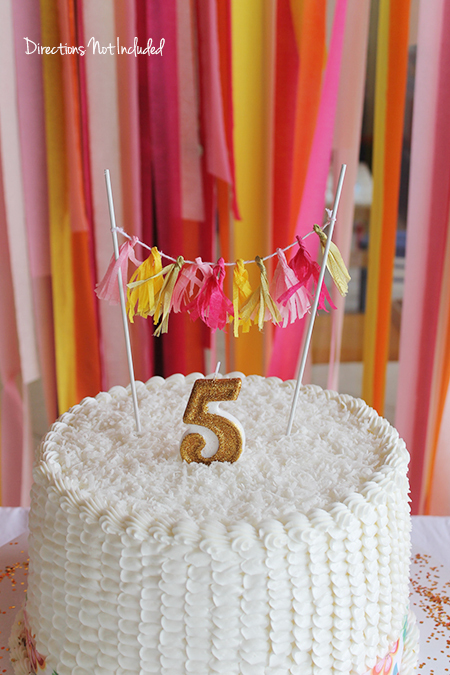 I’ll make a tutorial for this soon because it was a quick, easy, and adorable solution for a simple cake. cutest cake ever! love the colors! 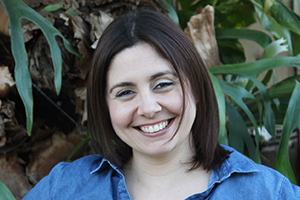 I was so happy with it. Birthday girl loved it which is all that mattered. I love how you dressed up the party! The cake banner along with the sparkly number is so cute and festive. 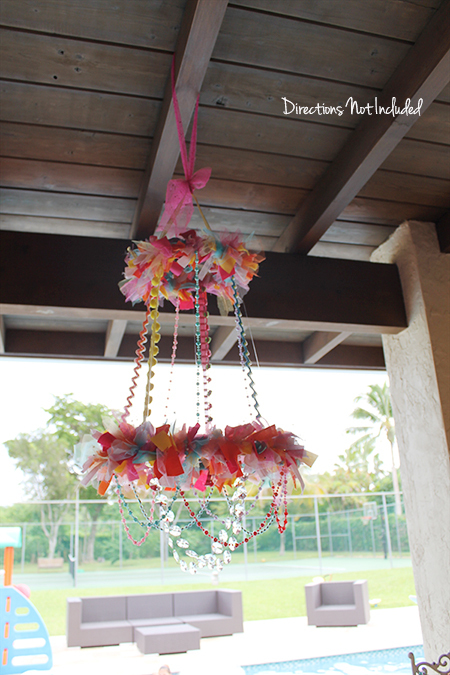 I don’t know that I would want the chandelier for a permanent fixture, but I am not a 5-year old little girl, BUT, I think it is an adorable party decoration! Great job and creative! Exactly, I don’t have the taste of a 5-year old but it makes her happy and mom happy!